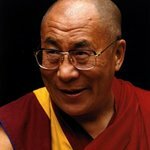 The Hawai’i Community Foundation (HCF) has announced that it will sponsor two public talks in Honolulu featuring His Holiness the 14th Dalai Lama of Tibet, April 14th and 15th, 2012. The talks are part of the Dalai Lama’s three-day stay on O’ahu (April 14-16), where he will participate in a series of conversations with local leaders and visits to important cultural and historical sites. The Dalai Lama is visiting O’ahu at the invitation of Pierre and Pam Omidyar. Support is being provided by a lead grant from the Omidyar Ohana Fund in addition to other partners providing in-kind and cash donations. 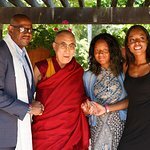 The Dalai Lama’s visit marks the launch of a new HCF initiative entitled “Pillars of Peace Hawai’i: Building Peace on a Foundation of Aloha.” The program aims to bring global peace leaders to Hawai’i to exchange ideas about the many forms of peace that exist here at home in Hawai’i, and around the world. The visits from global leaders are designed to spark dialogue about the roles of compassion, diversity, and culture as key components for practicing peace. The Dalai Lama will speak at two public events during his visit to O’ahu; both will take place at the Stan Sheriff Center on the University of Hawai’i campus at Manoa. The first event, for high school and college students titled, “Educating the Heart,” will be held on April 14th, at 1:30 p.m. HAST. More than half of the tickets for this student talk are free and being distributed through public and private high schools on O’ahu. The second event, intended for the general public, “Advancing Peace through the Power of Aloha,” will take place on April 15th at 1:45 p.m. HAST. Tickets for both events can be purchased online starting February 22nd at 6:00 p.m. HAST. Beginning February 23rd, tickets will also be sold at the University of Hawai’i Stan Sheriff Center box office. Additional ticket and event information is available at www.pillarsofpeacehawaii.org. For those unable to attend in person, both events will be available for playback after the events conclude on the Pillars of Peace Hawai’i website. For more information about the Dalai Lama’s visit to O’ahu, please call 1-855-PEACE00 (1-855-732-2300), email info@pillarsofpeacehawaii.org or visit www.pillarsofpeacehawaii.org.